The first time I stepped on the Red Carpet & ended up in a room full of Celebrities. (The closest I will get to the real thing, although I have met several) was a fab experience and I’m looking forward to it again in a few Months. Madame Tussaud in Los Angeles for me is far more superior to the one in London although we have the advantage in London of having the Planetarium but as I was last there back in the early 80s, it may well be a whole lot different now. LA is an extremely busy place with lots to do, plenty places to eat and amuse yourself, and of course lots of shops for you shopaholic. There is definitely something for everyone. There are also the Tour Bus’s which on the two occasions I’ve been to LA I didn’t have time to do but certainly will be doing this time so watch out for an update on that. Right beside Madame Tussaud Hollywood, the TCL Chinese Theatre has been a cornerstone of Hollywood history and motion pictures for 75 years. 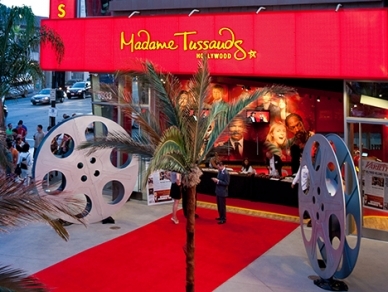 Take pictures with the handprints of Hollywood icons and celebrities and go on a tour of the theatre. The Hollywood Walk of Fame is an internationally recognized Hollywood icon. With about 24 induction ceremonies annually broadcast around the world, the constant reinforcement provided to the public has made the Walk of Fame a visitor favourite. In the heart of Hollywood, stroll the streets and see the stars on Hollywood Blvd. and Vine Street.